Ranunculus - Orange-Red Ranunculus is known for its many colorful petals. A single bloom averages dozen of petals, in many bright colors. 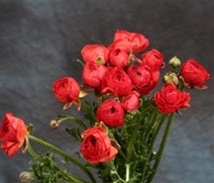 Wholesale bulk ranunculus flowers are perfect for wedding bouquets, table centerpiece or flower arrangement. Free Shipping! It is normal for your Ranunculus flowers to look thirsty when they arrive. They are shipped in a dry pack and need to be re-hydrated. Florists receive their flowers the same way. If you follow these easy steips, and re-cut the stems and change the water every 3 days, you will enjoy maximum vase life. Prepare clean containers like 5-gallon buckets with at least 4 inches of fresh, cool water. Add floral food to prevent bacteria from growing in the water and to give added nutrients to the Ranunculus flowers. Flower food can be purchased at any local florist if you don't have any. In a pinch, you can use some Sprite and a drop or two of bleach to inhibit bacteria. Cut box straps. Remove flowers from box. Leave rubber bands holding the flowers together in a bunch for the first few hours or re-hydration. Remove any leaves that fall below the water line. The idea is to deprive bacteria of extra food. Cut the stems with a sharp knife or scissors diagonally about one inch from bottom of each stem. Allow the ranunculus flowers at least 4-12 hours to hydrate properly. Keep away from direct sunlight, drafts or excessive heat. Change water every 2-3 days or when the water becomes cloud. The flowers will drink a lot of water at first. Keeping them in a warmer room speeds up blooming; Keeping in a cool room slows it down. DO NOT PUT IN A REFRIGERATOR. Ranunculus is known for its many colorful petals. A single bloom averages dozen of petals, in many bright colors. Each stem has 1 to 5 blooms, depending on the season. Average stem length is 6 to 12 inches. Expected vase life is an average minimum of 5 days. If you change the water and re-cut the stems every 3 days, you should get much longer life. We recommended you schedule your delivery date 3 days before your event. It is never a good idea to schedule the day before. Sometimes there are delivery delays beyond our control. Colors may vary with the camera that took the picture as well as your computer monitor, not to mention Mother Nature's variations. Substitution Policy - While we make every effort to provide the exact flower color you order, sometimes a substitution may be required to assure your flowers are delivered on time. If so, we are careful to make your order as close to your original choice as possible, even if this means substituting flowers of greater value. While our goal is to always keep you informed, we may ship a substitution without confirmation from you.